I was a bit nervous setting up for my class this morning with the 16 T3alliance students at the Upward Bound program in Puerto Rico. I hadn’t spoken Spanish to a group of teens since early in my teaching career when I taught at bilingual schools in Colombia and Ecuador. I always try to remember that new students want to know who you are, and want to know that you care about who they are. I spent the prior evening preparing a slideshow with a bit about my family, my background, and my role in T3 alliance. I finished with an exciting set of stories about what students in our T3alliance program were doing in Hawaii. The kids were visibly excited to set up cameras and sensors and make the kinds of things I had described. After just having helped students in our Hawaii program complete this kind project in just under a day, I felt pretty confident of where things were going when I asked the students set up their Raspberry Pi boxes. To my surprise, students weren’t able to get online because of a discrepancy between the clock on the pi’s and what the browser expected to see. I spent several minutes trying to fumble around with one students pi, while at the same time realizing that they had not had the ability to use the internet up until this point. I was shocked, and was preparing to teach all the students how to set up the LED light ring and camera with words alone, when a student in the back of the room came forward with a solution that he had found on some website. It involved going into the terminal, and setting the date. 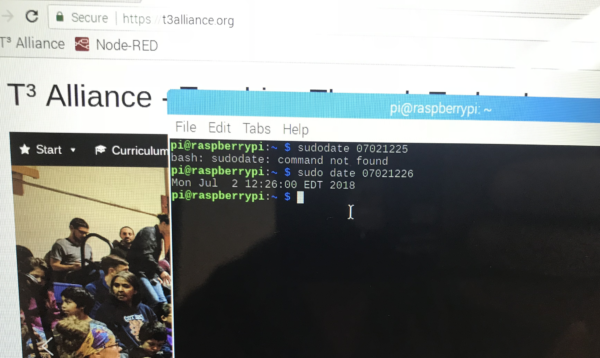 After this, we were able to reboot the pi’s and access the t3alliance website. A few students stepped forward and made it work for everyone. A sense of relief washed over me, because I rely on the website (or someone else who is more knowledgeable than I) to know what goes where in Node Red. Here is a forum post describing how to fix it. The students were eager to try everything on the website. I directed them to start with a the LED ring, and then the camera. Some students were able to make their equipment do what the tutorials said, and others were stuck. I had kids get up and walk around the room and work with each other to try to diagnose the problems. This worked to a degree, but when I couldn’t figure something out, and none of the other kids could, we sometimes had to shrug our shoulders and try the next sensor. By the afternoon, we had enough sensors working on a handful of different pi’s, that the kids had the idea of how things could be combined to make a project. 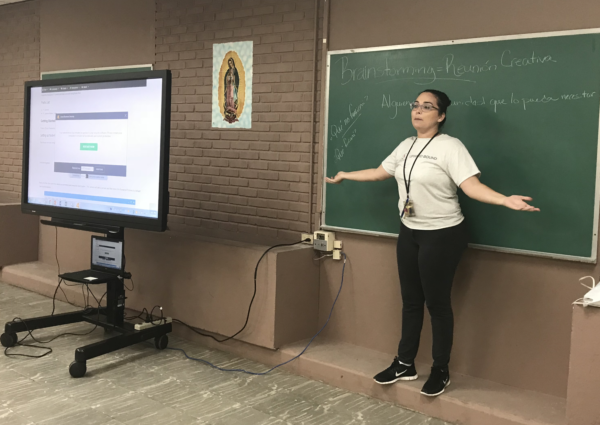 Francheska had converted the mini grant proposal I shared with her into Spanish and she helped lead the students through a brainstorming session about how the school might address the security issue from broken windows associated with Hurricane Maria. The students, with the help of Francheska, divided themselves into teams with specific tasks associated with gaining an understanding of the problem and brainstorming some possible solutions. After the students left I had a chance to meet Steven, the regular instructor for the T3alliance program. He wasn’t at the training in Reno, but he had familiarized himself with the pi and taught the students to use the sensors with python. He will work with me tomorrow. After everyone left, I had a chance to re-learn Node Red and build a tutorial for the project. I learned just how much I was leaning on my team in Hawaii to do all of the “complicated” stuff. I can appreciate what the instructors in the T3programs across the country might be going through as they try to make the technology work. There are now several new posts on the site, one that will hopefully be fun for all your students is the Node Red Selfie Station set up post. I plan to share this with the students here in Puerto Rico tomorrow. If all goes well, they will be able to turn the technology described here into a security system for the university. On the second day of the training the students came into class and I pointed them directly at the tutorials. I was eager to share everything as quickly as possible, and get the students working successfully on building what I had put together the evening before. 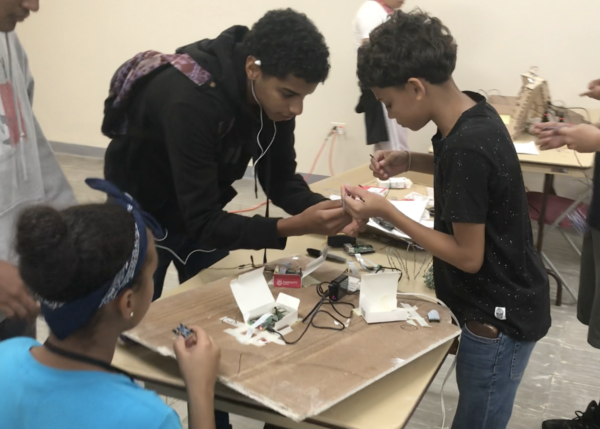 The plan would be to have everyone build the button activated camera selfie station, and then we would collectively apply that same technology to building the security system for class room that had lost its windows from Hurricane Maria. Some students were good at following online tutorial, others were either waiting for me to tell them what to do, some were sneaking onto their phones when I was distracted helping another student. The fact that some of these students spoke better English than others might have played a role. They were polite when I asked them to put them away, but I could tell they didn’t all feel comfortable getting up and moving around the room to ask others for help when I was busy. After about an hour 75% of the students had a successful selfie station. I asked the student that had demonstrated her leadership skills to lead the class in hearing the reports on the tasks from the previous day. Some students had not done their tasks, others had done an amazing amount of work, measuring, taking photos, and presenting everything in a nice folder. A few of the mini grant proposals were filled out with clear information. Having a discussion with 17 students was tough, especially when some felt like they were good for doing their work and others felt not good for being slackers. We walked to the room and discussed what the system might look like with the most engaged students. The other students stayed behind and spoke with Francheska about the mini grant proposal and staying engaged. We developed a plan to mount the Raspberry Pi’s above one of the ceiling tiles, and cut tiny slits that would just fit the thin ribbon of the Pi cameras. We unwound a network cable made extension wires that were able to fit perfectly into the jumper wire cables that came in the kit. There were enough jobs here that almost everyone stayed busy. 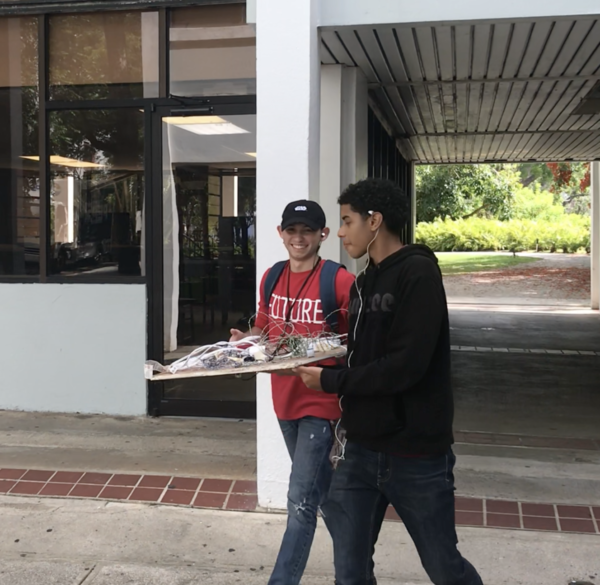 A few students were working on the Node Red Flow, some other students worked on getting an email that was ready to receive photos, and the rest of the students were hovering and offering some sort of help. During lunch I made sure all the Pi’s were set up to be on the same network as the wifi hotspot so as to be able to control them through the network when no screens were attached. The regular university wireless network worked to send data, but it didn’t work when we wanted to “talk” to the Pi’s. It has to do with the security they put in place. 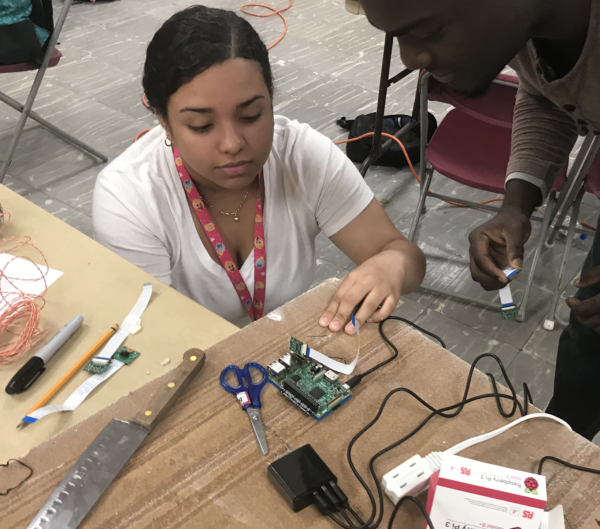 We spent some time after lunch working on the final setup when Francheska announced that she had secured a field trip opportunity for our last day to an area that had experienced damage after Hurricane Maria. 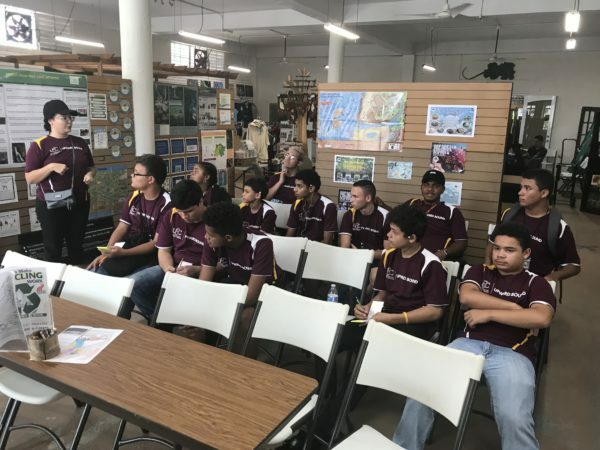 The students were very excited, and eagerly accepted the renewed requirements to brainstorm ways that the class might use sensor technology to help in the community. After a few final checks with the cellphone and making sure the wires had good connections, we came to the moment when we were ready to install the sensors. 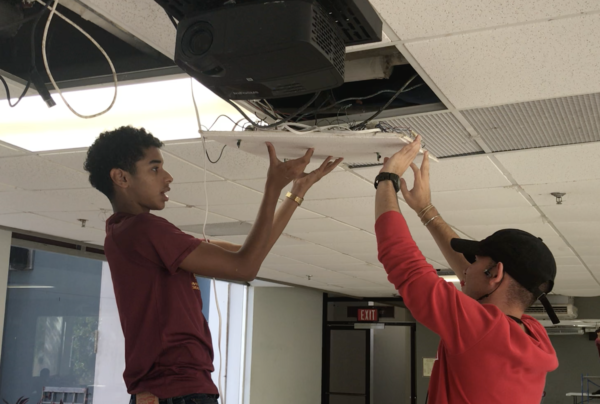 The students carried the ceiling tile sensor setup to the classroom and got right to work. Suddenly everyone was involved. The ceiling tiles were moved and students passed the sensor to the area with the broken windows. After plugging in the pi’s to a power source, the students ran over to the various windows and began waving in front of the sensors. One student was watching the gmail account on his phone and yelled out that he got something. The moment when the photo opened we knew it worked. Collective congratulations went around, as the students purposely triggered more photos. Francheska went and spoke with the facilities director who came and saw the work of the students. He was obviously impressed and thanked the students for their work. The students were glowing with pride and promised to maintain the system and help make sure it worked. Discussions began organically on how the system could be impoved or added to. Plans were made for science type experiments to understand the limitations and capacity of the sensors and their adjustments. This was a successful day in my book. The students “felt” like they had done everything, but I knew just how much effort I had put in to assure that it would work. What had really worked is that the ownership and efficacy had been allowed to foster and germinate. The kids “thought” that they could this kind of project now, and they saw stubborn determination and growth mindset as a skill that they had access to. 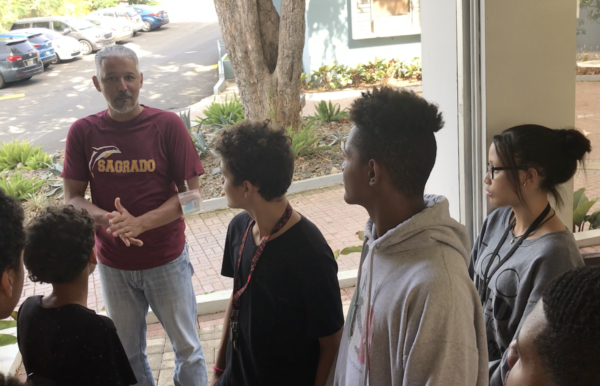 It will be exciting to visit some rural areas of Puerto Rico with these students to see what ideas they have for future projects. Today was an excursion day with the goals of exposing the students to some possible project locations, doing some service learning , and having fun. The students arrived in the morning and submitted their homework from the previous class. 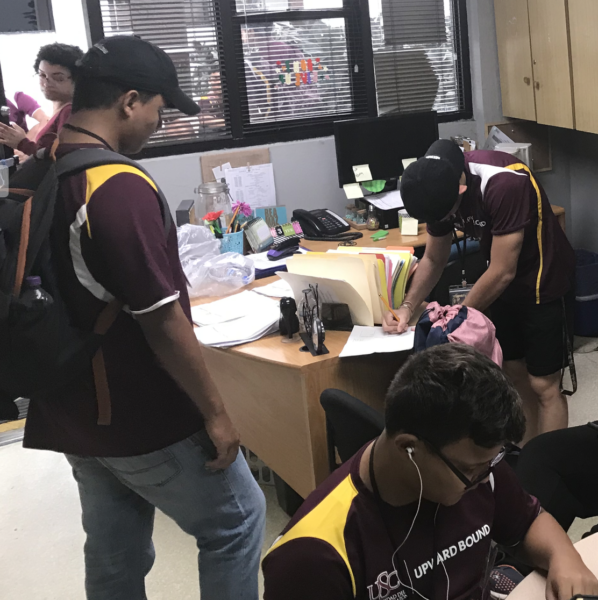 The ones who hadn’t finished their homework, filling out a mini grant for a possible project in the community using Raspberry Pi and sensor technology, had to go and finish their work while everyone else waited. 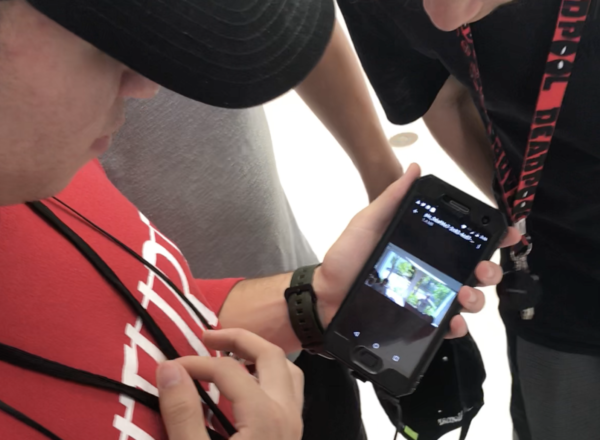 This method turned out to be very effective, as the students waiting gave suggestions and feedback to get the team on the trip as quickly as possible. I used the time to go through the plans for the next several weeks of class with Steeven, the T3 instructor, and the students that Francheska and I had identified as the lead students in the class. You could see the students I spoke with puffing their chest’s out as I told them how impressed I was with their effort and their growth mindset. 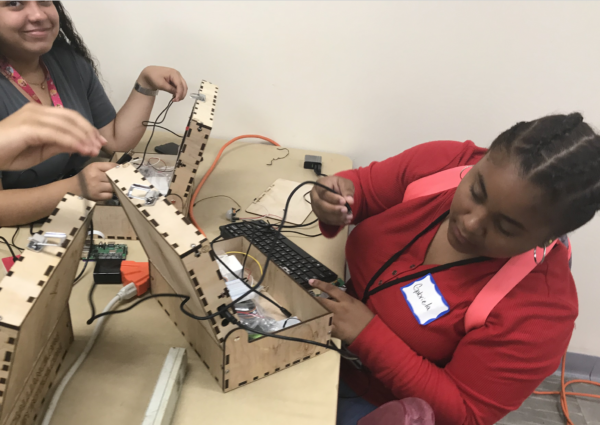 They agreed teach other students in the program how to use the website, set up the sensors, and continue modeling the growth mindset as they found new projects to work on. Francheska gave me an Upward Bound shirt to wear on the field trip, and we piled into the van and headed off to El Yunque National Forest. This area has been a protected tropical forest region since 1875 when Puerto Rico was a Spanish Colony. Its a tropical rainforest with trails, waterfalls, and a number of endemic species. 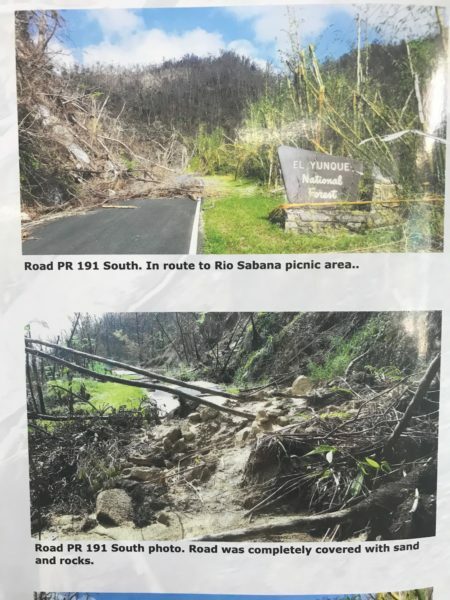 It suffered greatly during Hurricane Maria and many of the roads and trails were still closed. We went to the visitor center where Francheska and I spoke with Megan, the park superintendent, about partnership possibilities while the students viewed a natural history movie. Megan was very supportive and said she would speak with scientists who are in the park about some possible projects. She helped us understand how we would need to navigate the process of getting teams of students into the park to work with scientists and to install our home made sensors. When I informed the students about the conversation and the possibility for projects, they were visibly excited. After lunch, we went to long sandy beach on the south east corner of the island. 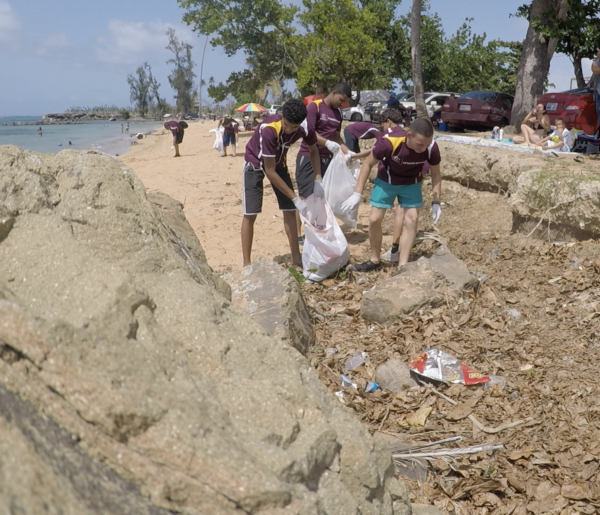 Francheska handed out garbage bags and had the kids work in pairs to pick up the beach. 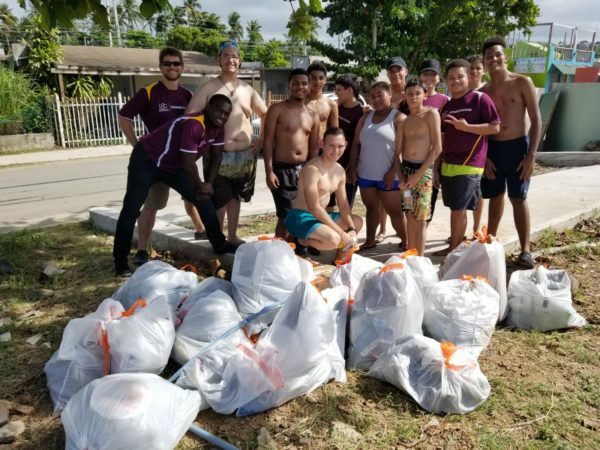 Some of the trash may be due to Hurricane Maria, but most of it was likely left on the beach by the local visitors. The experience was awesome, and students were eagerly finding trash stuck the many crevices between rocks partially buried the sand. After an hour we had collected a small mountain of bags. Francheska laid out the rules for getting in the water, and handed out a tennis ball. For an hour the students played catch like elementary school children in the warm shallow waters while Francheska kept a watchful eye from her beach chair. 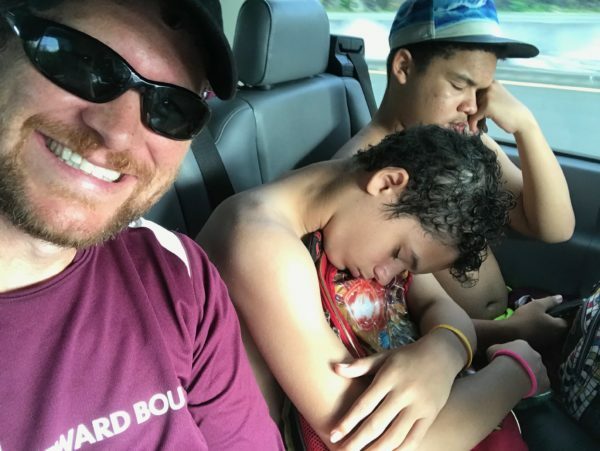 On the long ride home, the two students next to me fell asleep in a position that showed just how much energy they had expended during the day. Francheska and Steeven understand the importance of allowing students to engage and give back to their community. Giving back in a conscious way fulfills a basic human need for belonging. The students here understand the expectations and rise to the challenges that are put in front of them. I look forward to watching them grow over the next few years. A great post and update Adam. Send our regards to Francheska and the students. Keep sending the pictures.